The latest mass school shooting is bringing out the know nothing punditry, each with their calls for better mental health services, gun control, or more armed defenders. Few if any say anything of substance in regards to the true state of affairs. Governor Bevin, of Kentucky tried, but only got eye rolls and derision from the left. Evidence shows, the school death toll from gun violence is going down, but this is a misleading stat. While personal deaths due to personal conflict is dropping, the number of mass shootings is on the rise. The latter trend goes far beyond access to firearms, or inadequate mental health services; nonetheless, it seems society is intent on treating the symptoms while making the disease worse. The reasons the latest mass shooter choose his victims are varied, but one example is girl who turned him down for a date. What gave him such a sense of entitlement that he felt this justified murder? For that matter, what led him and the Parkland shooter to feel killing people was okay? The method they choose is irrelevant, it could of been bombs, cars, knives, fire or a host of other things. The largest school massacre in U.S. History was the Bath Township school bombing; 45 lost their lives due to a disgruntled farmer mad about property taxes. Guns are merely the plat du jour. As London has showed, a lack of access to guns does not prevent anything. Thanks to unfettered immigration, it is now the murder capital of the west, with knives being the weapon of choice. Other places, people have shown cars can be just as deadly as guns when the desire is to create mayhem. The real question is why so these devils value life so little. One part of the answer might lie in a question talk show host Dennis Prager often asks students. When he speaks to High School and college students he inquires of them, “if a stranger and your dog were drowning who would you save?” The numbers that answer the dog varies, but he says it averages around a 1/3rd. The answer reveals the extent the left has been able to equate the value of human and animal life. Gone for them is the idea of man being in God’s image, giving human life immense value. While most of society understands this intrinsically, they unlearn it under the tutelage of leftist in state sponsored schools. Devaluing human life is one factor, but not the only one. To kill in mass one must have a sincere sense of self-entitlement. The ultimate in self-centeredness is to take the life of another human being who posses no threat. The reasons today’s youth feel entitled are many, but include things like participation trophies and being told they have a right not to be offended. Additionally, they are told day in and day out that others must accept individual deviant behaviors, but individual responsibility for one’s impact on others is not mentioned at all. For the mentally fragmented, an orderly society gives guidance, a pathway to follow. When taught self-reliance, and to accept defeat in all forms, he is able to cope. On the other hand, the troubled soul fed a steady diet of self indulgence, and lack of respect for human life, the likelihood that he will strike out in monstrous ways increases dramatically. It is not the average student, at this point, that is striking out and killing as many as possible, but those with mental instability all ready at play. But, this does not mean the factors driving school shooters are not affecting the greater society as well. Nazi Germany was not created in a day. Bismark laid the foundations of socialism and a national sense of entitlement in the German psyche long before Hitler wrote Mein Kompf. The decades before they embraced Progressives and Fabian Socialist beliefs regarding euthanasia and directing humanities evolutionary progress. They believed the Progressive dogma that most intelligent should direct the actions of lesser intellect. Even mass murder to get rid of society’s dead weight was openly discussed. In fact, the challenge to create a deadly humane gas for extermination purposes was proposed England’s Fabian Socialists long before the Nazi’s developed it. The self-absorbed amoral murderers seen as of late are symptoms of a much deeper disease. As it was in the decades leading up to World War II, there are calls from within leftest intelligentsia to not only expand who can be killed and why, but calls for mass murder of their opponents as well. More alarmingly, many students are taking their professors mindless dribble seriously. When one adds to this that these students have been raised with the same sense of entitlement, and lack of respect for human life as the school shooters have, one starts to wonder where will it all end? 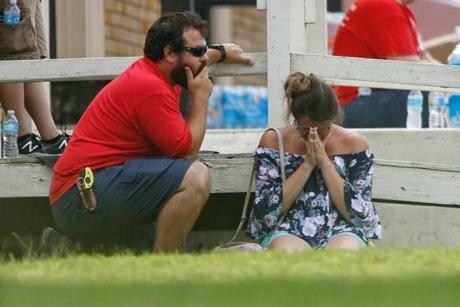 The mass shootings are not merely cases of deranged individuals, but a symptom of a society in peril. Reflections of a monster growing within. One, if not stopped, will re-create a hellish society once thought vanquished.